Half of the anticipation of a vacation is built up en route to your destination and a good journey really can set the tone for your trip. 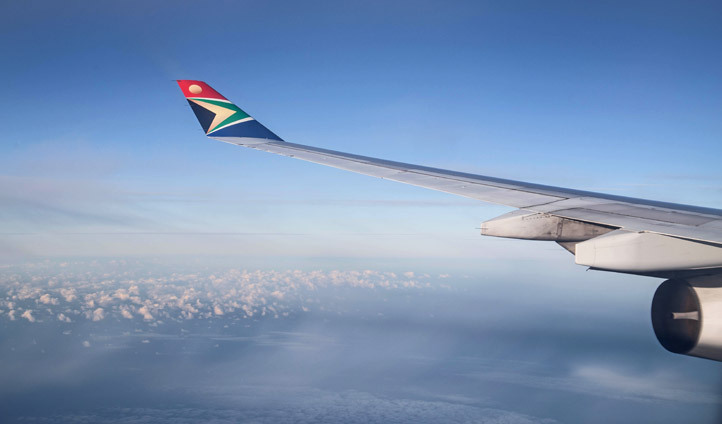 South African Airways has the benefit of being part of the Star Alliance, so eligible travelers are free to use their facilities where there are no SAA-specific ones. So, as I waited for my flight, in the Star Alliance lounge at Heathrow Airport, the tone of a vacation was well and truly set- it would be a trip of luxurious comfort. As I boarded the flight feeling relaxed and refreshed, I knew that I wouldn’t have to wait to land to start my South African experience. It had already begun. Settling into economy seating on South African Airways is comfortable and easy, but I took my seat in business and it really was deluxe. The seat was spacious and came with its own power sockets – handy for my rapidly dying iPod. The noise cancelling headsets meant that the noise of the engines didn’t interfere with my movie watching, and I was able to do all of this from 180 degrees, on my flat reclining seat. I’m an easy traveler, and had I not already seen the menu they had in store for the flight, I imagine the staff would have struggled to rouse me from a deep sleep. My anticipation kept me awake, however, and I enjoyed a dinner of smoked salmon with a fennel and pomegranate salad, followed by a chicken saltimbocca and mango panacotta. A menu bookended by canapes, cheese and crackers, I was unsurprised to learn that this inspiring menu was co-designed by famed Chef Benny Masekwameng, a Masterchef SA judge. Breakfast the next morning was equally impressive, with an offering of cooked or continental, juices, yoghurts and cereals. Landing in South Africa with this great flight behind me, I couldn’t be more ready to take the next step in my African adventure.